WHY do we need to help our students become fluent in basic math facts? And HOW can do that? I am so glad you asked! I will be answering those two questions for us! 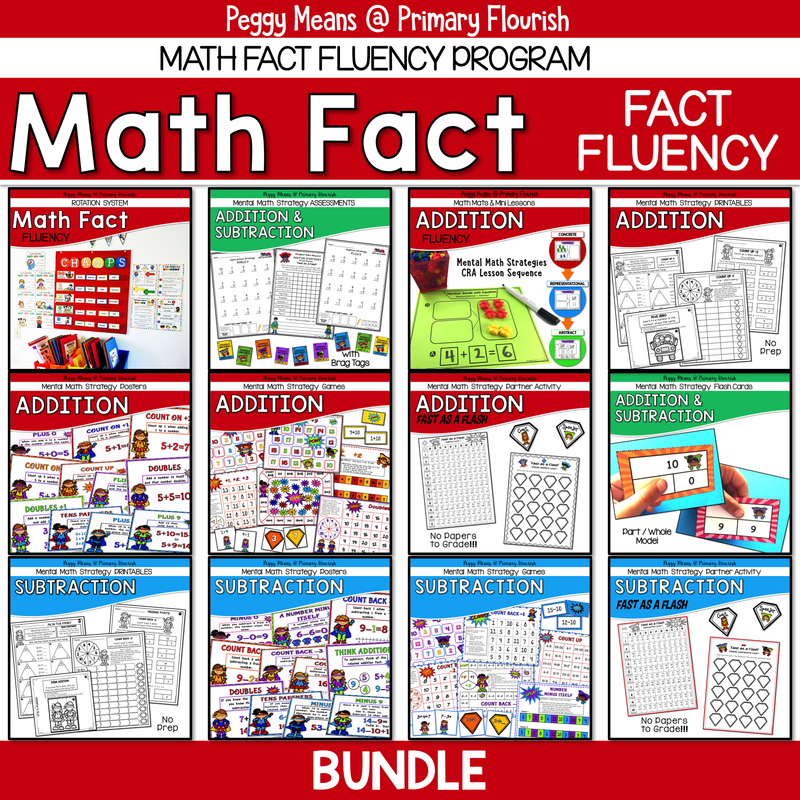 “Math facts fluency leads to higher order mathematics. Through automaticity students free up their working memory and can devote it to problems solving and learning new concepts and skills (Geary, 1994). Quite simply, a lack of fluency in basic math facts will significantly hinder a child’s subsequent progress in problem-solving, algebra, and higher order math concepts. Math fact fluency not only affects our students’ future success in math, but also in science and geography. 1OA Understand and apply properties of operations and the relationship between addition and subtraction. 1OA.4 Understand subtraction as an unknown-addend problem. For example, subtract 10 – 8 by finding the number that makes 10 when added to 8. 1OA.5 Add and subtract within 20.1OA.6 Add and subtract within 20, demonstrating fluency for addition and subtraction within 10. 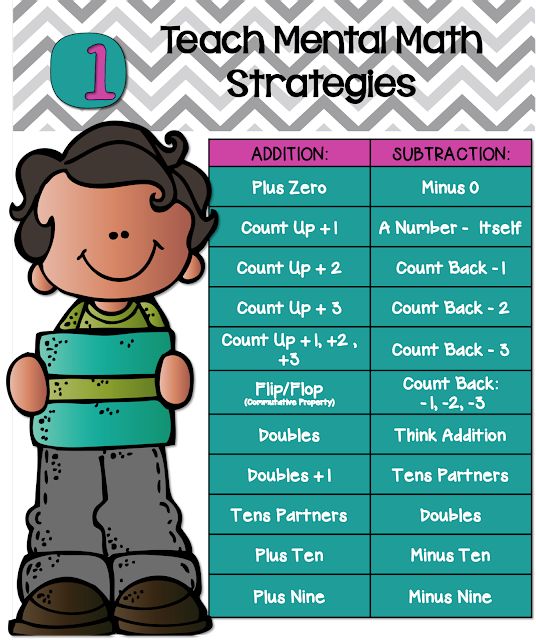 Use strategies such as counting on; making ten (e.g., 8 + 6 = 8 + 2 + 4 = 10 + 4 = 14); decomposing a number leading to a ten (e.g., 13 – 4 = 13 – 3 – 1 = 10 – 1 = 9); using the relationship between addition and subtraction (e.g., knowing that 8 + 4 = 12, one knows 12 – 8 = 4); and creating equivalent but easier or known sums. 2OA.2 Add and subtract within 20. Fluently add and subtract within 20 using mental strategies.2 By end of Grade 2, know from memory all sums of two one-digit numbers. 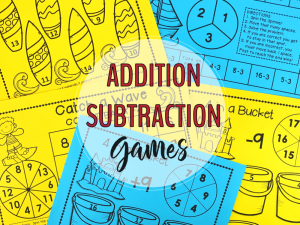 3.2 NBT Fluently add and subtract within 1000 using strategies and algorithms based on place value, properties of operations, and/or the relationship between addition and subtraction. 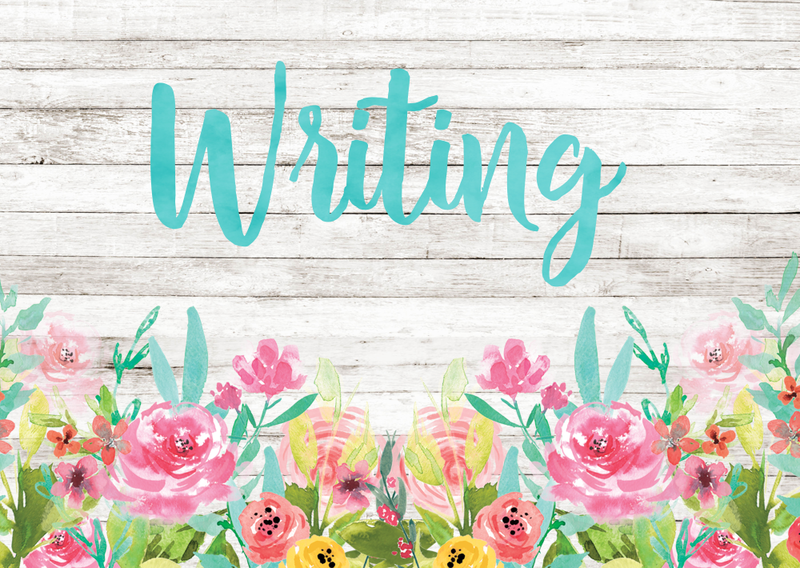 So we know the WHY – let’s talk about the HOW! 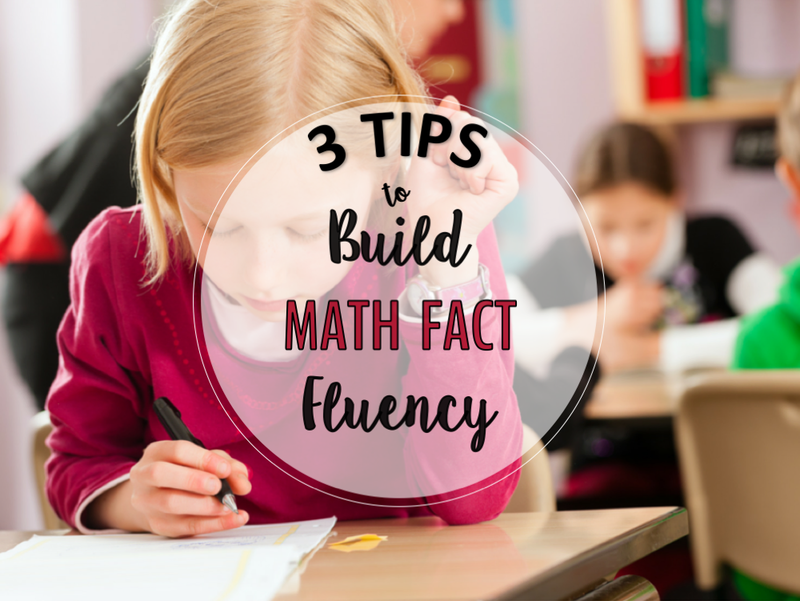 Here are 3 Tips to make math fact fluency teaching and practice more effective for your students. I had a huge ‘aha’ moment years ago, when I had moved from teaching kindergarteners for years to 2nd grade. The students were taking a timed math facts test so I could assess their level of mastery, and I thought I should know how long it would take me to complete the page of math facts. So I took it. 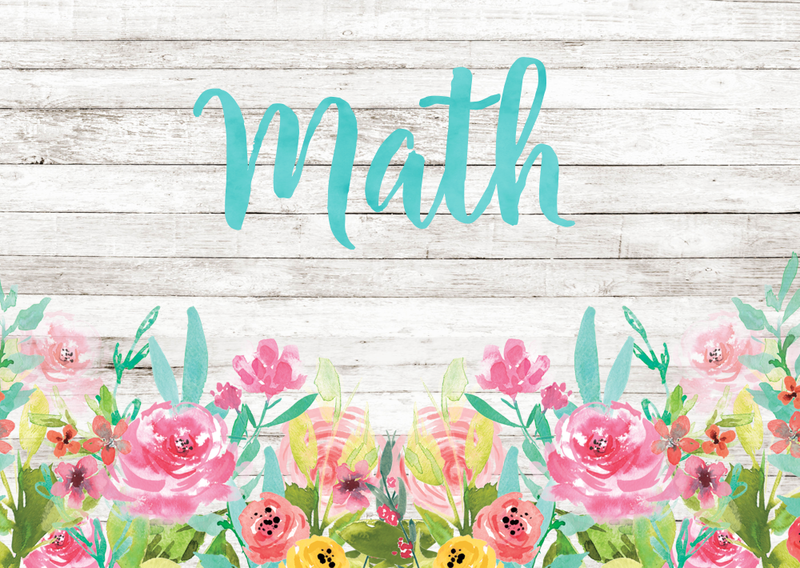 I was amazed at how I was thinking as I was answering – I did not have many of the facts memorized, but I was using the mental math strategies to derive the answers! WOW! and I was super fast. Even though I did not have them memorized, I understood the relationships, so I knew the answer almost ‘automatically’! And of course, research bears this out – students who are taught mental math strategies are quicker in computing than students who are taught to just ‘memorize it’. I created and use these anchor posters to teach and reinforce the mental math strategies. 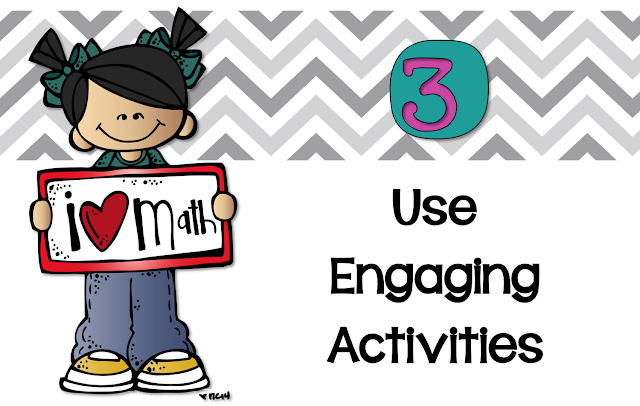 They are also helpful to put on your classroom walls for students to quickly refer to as they are doing math. 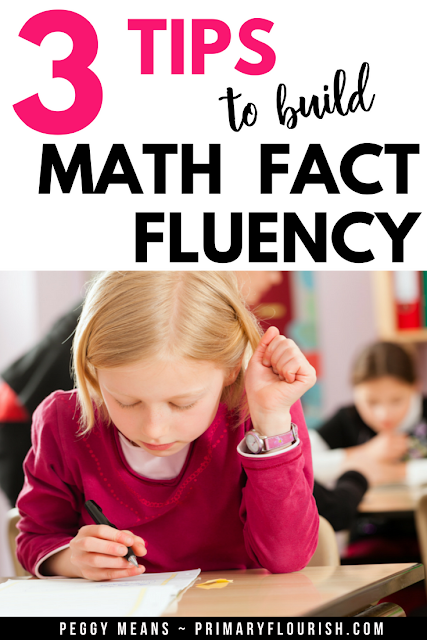 “To build math fact fluency, the most effective strategy is to give students 10-15 minutes per day to practice using what are called derived facts strategies (DFS). Essentially, DSF’s are using facts you know to solve facts you don’t know.” Sam Strother, Associate Director Developing Mathematical Thinking Institute. Don’t you love that term- Derived Facts Strategies because it describes the process? We derive from what we know. . . to a new fact. As teachers we MUST make time in our already packed day to provide this 10-15 minutes practice per day. Gone are the days when we can tell the parents to teach it at home. Most parents don’t have the time, or the mathematical understanding to teach using Mental Math Strategies – or DSF. Read Strategies that Increase Math Fact Fluency to learn more about Derived Facts. 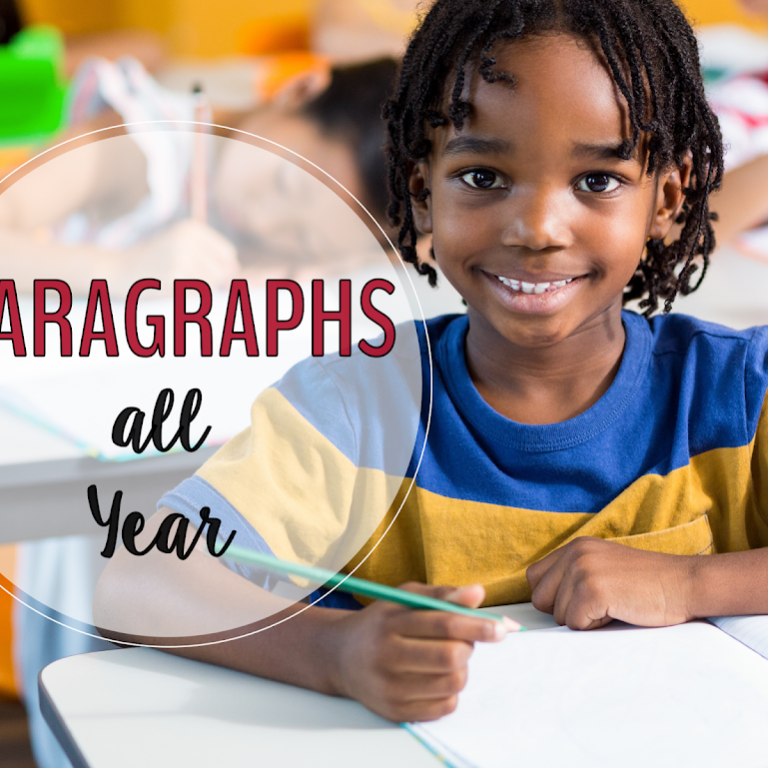 We know from experience and research that students learn best when they feel safe and are engaged in a fun activity – enter math games, student goal setting, and cooperative learning activities! 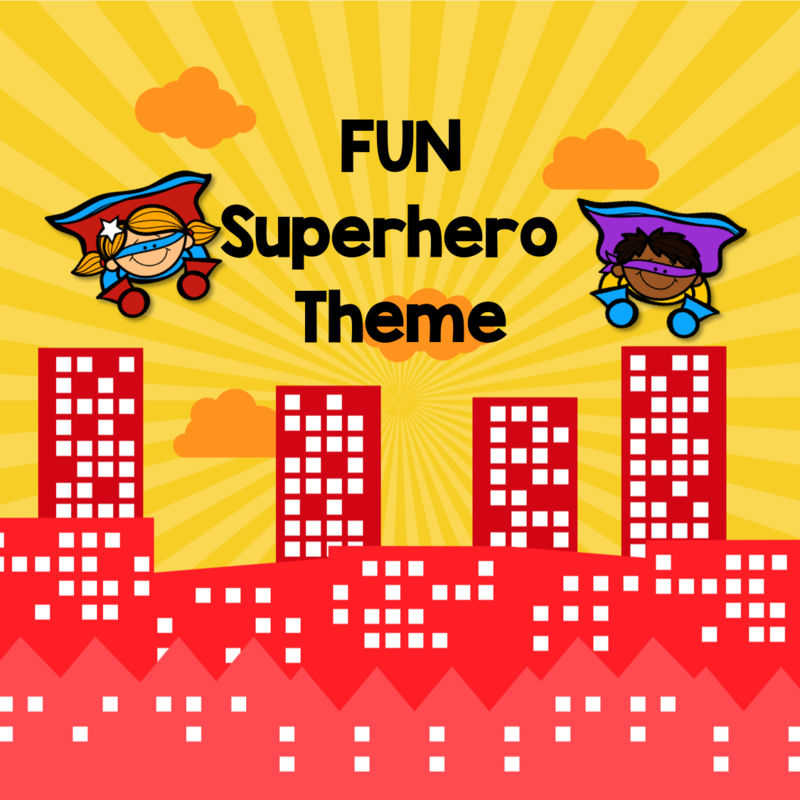 Students love the superhero theme! 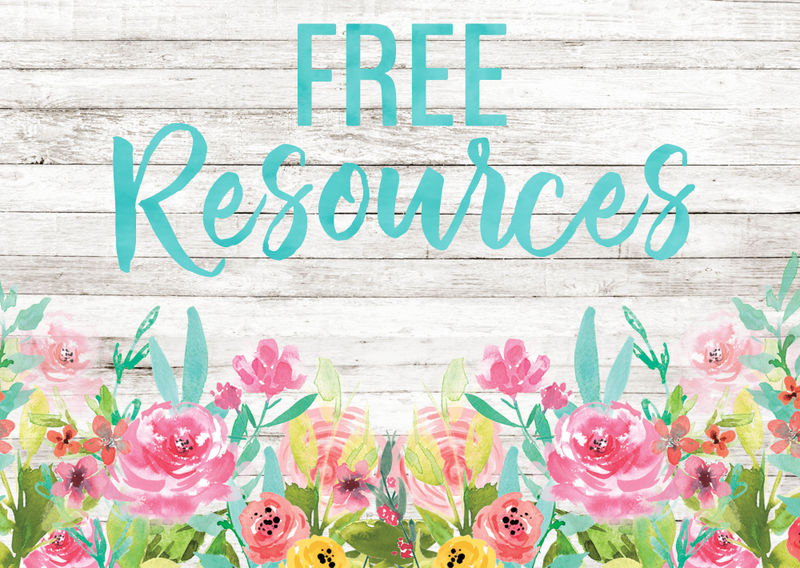 Most of the resources in this bundle us these engaging graphics to captivate your students attention from the start! 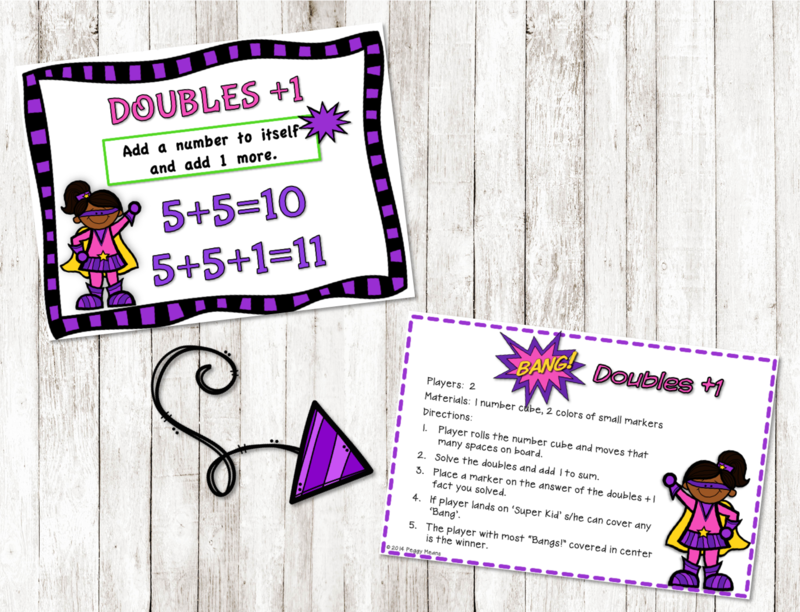 You will find these cute and engaging Super Hero graphics in most of these Addition and Subtraction Fluency Resources. 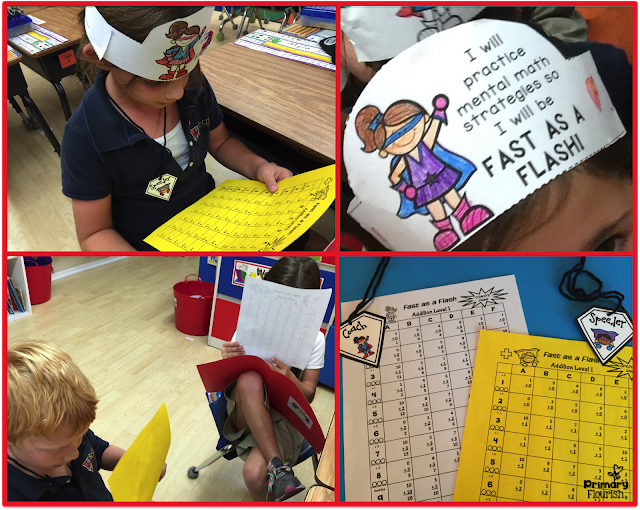 Tell your kids that mental math strategies are their super powers in math! 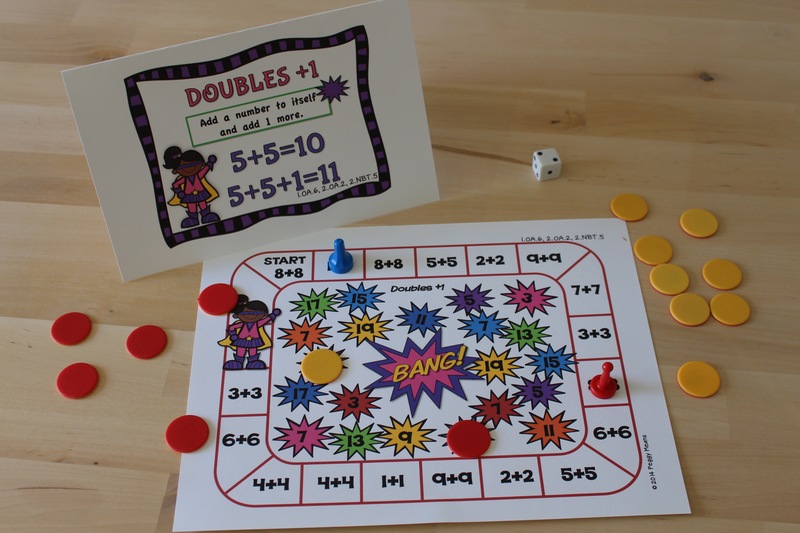 Your students will enjoy playing these engaging Super Hero games with their friends and becoming more fluent in their addition and subtraction math facts in the process! Learning Games provide a fun, not-threatening opportunity for students to get the needed practice to become fluent in their math facts. They will be engaged and having fun. You will not have any papers to grade! Sounds like a WIN WIN! 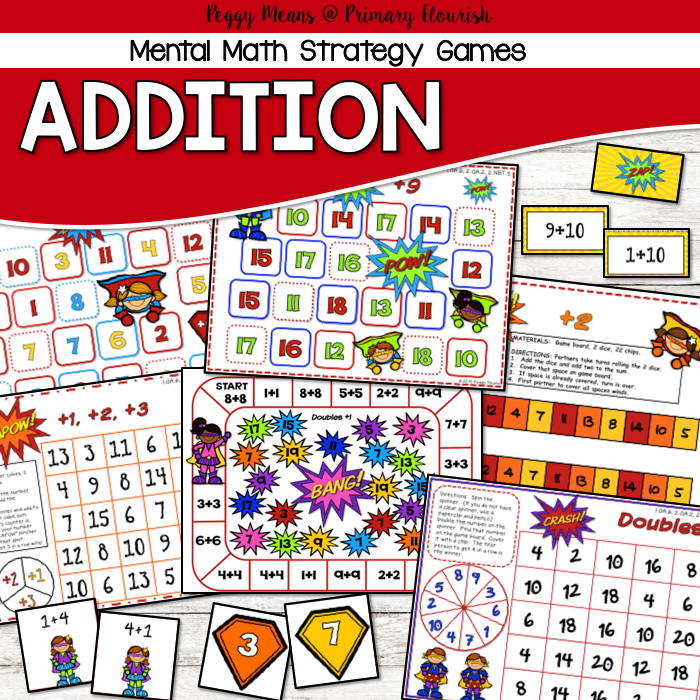 There is a GAME and mini POSTER for each of the following mental math addition strategies mentioned above. 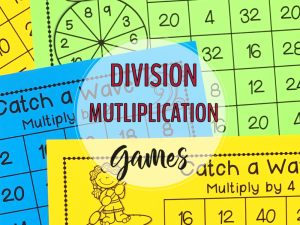 Games are perfect for whole group, small group, partner work or math centers! Having the rules and strategy illustrated and defined for each game makes them the perfect choice for independent work. 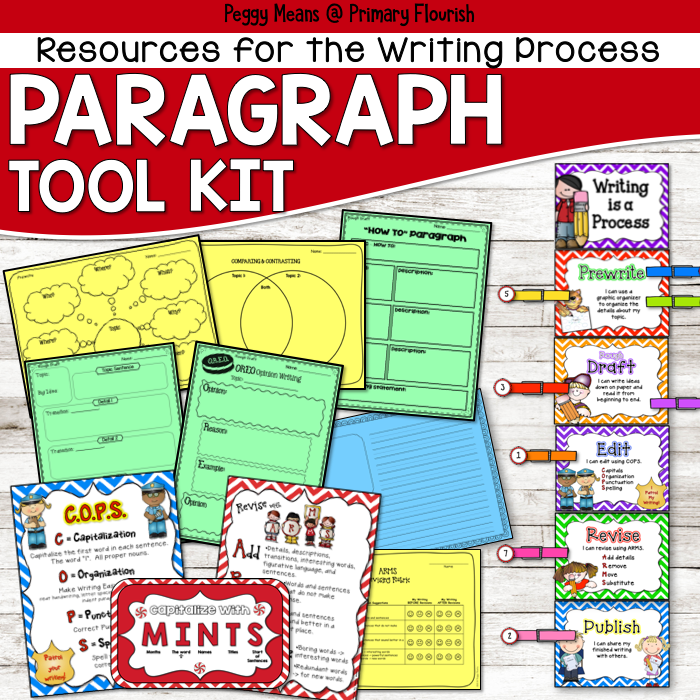 Your students will indeed become fast as a flash with this super engaging and motivating activity! 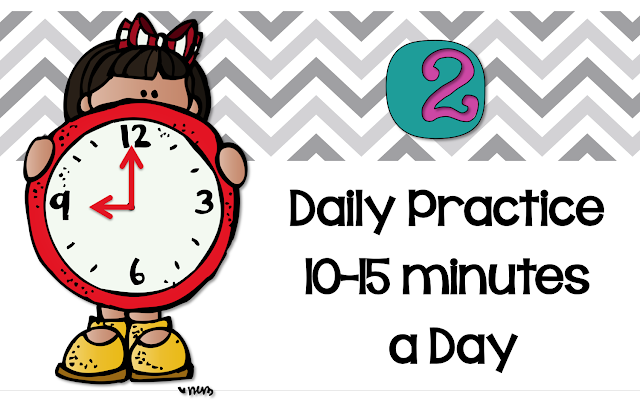 Once your students learn the routine, they will increase their math fact fluency in less than 10 minutes a day! And you will have NO PAPERS TO GRADE! 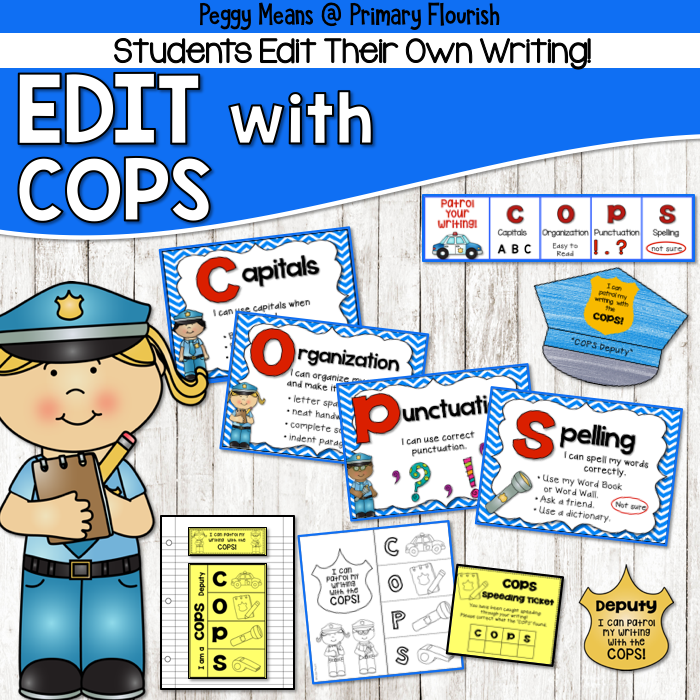 Here is another engaging activity that your student will want to do and ASK you to let them play! 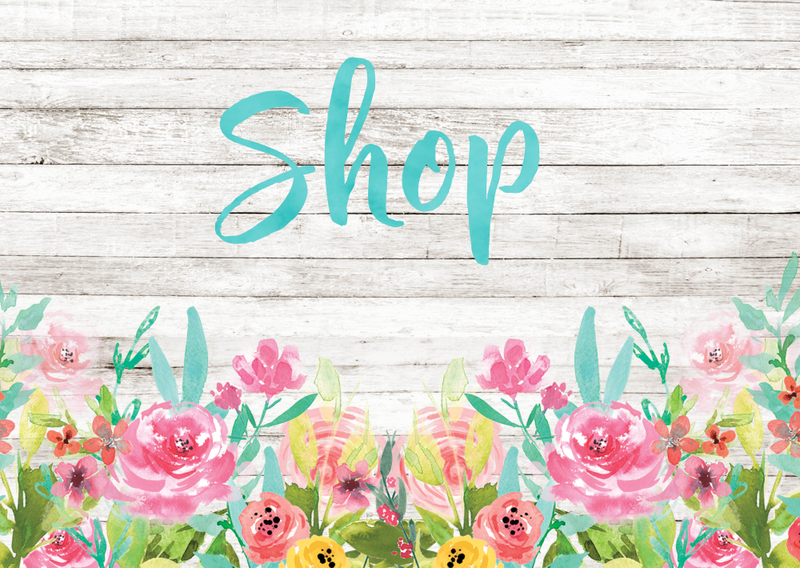 Once you have the cards printed and cut, there is no further preparation! 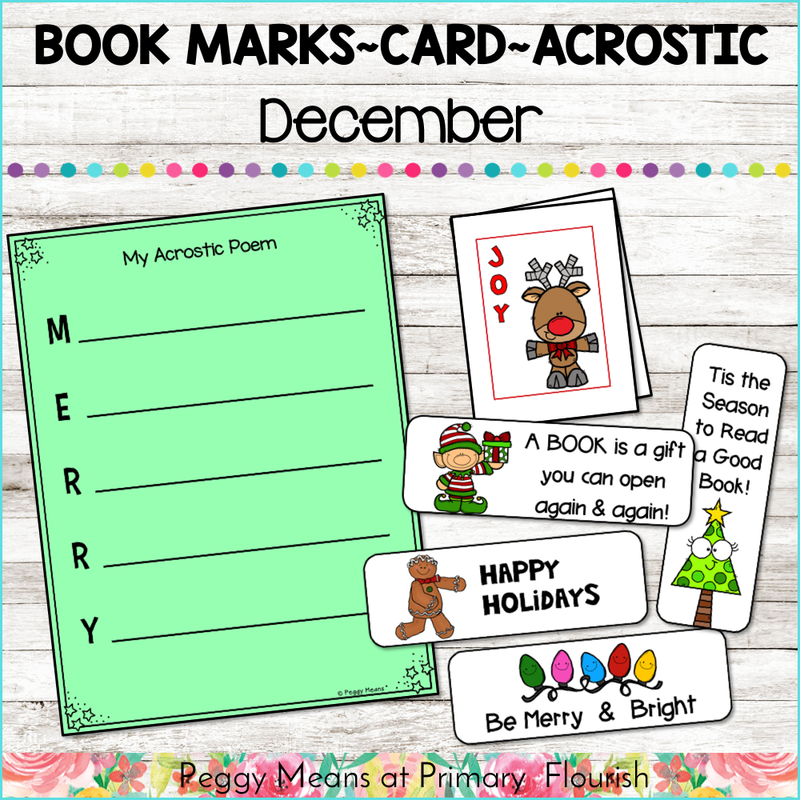 Just pass the cards out and watch your students enjoying practicing! And you will have NO papers to grade! 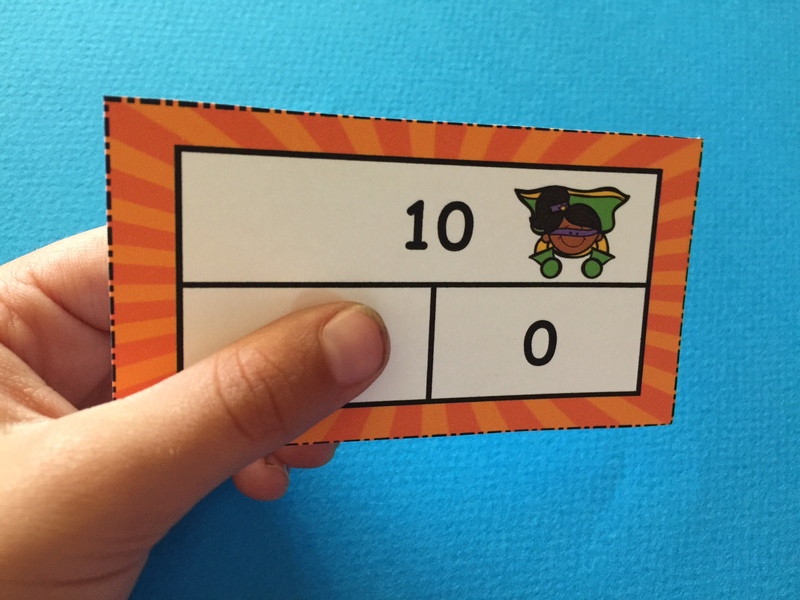 The cards use the Part/Part/Whole Model, so your students will be becoming familiar with the relationship between addition and subtraction! Read Make Lessons Interactive with Partner Quiz to see how easy and effective this activity is. Click on the picture below to get all these engaging activities and more in this complete program. 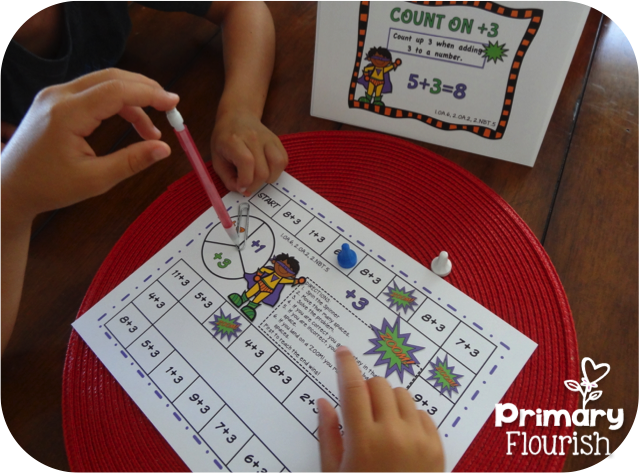 It has everything you need to help your students master their addition and subtraction facts! It’s never too late for your students to master these facts! 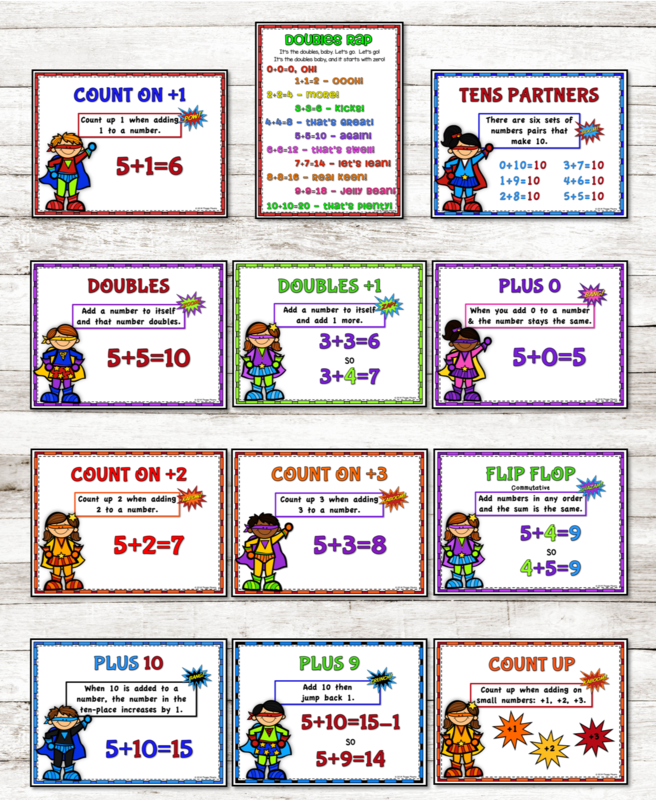 I have been using these engaging activities in my classroom for years and I know from experience that my students got ‘Fast as a Flash’ with addition and subtraction math facts. I hope you are inspired with these 3 tips! 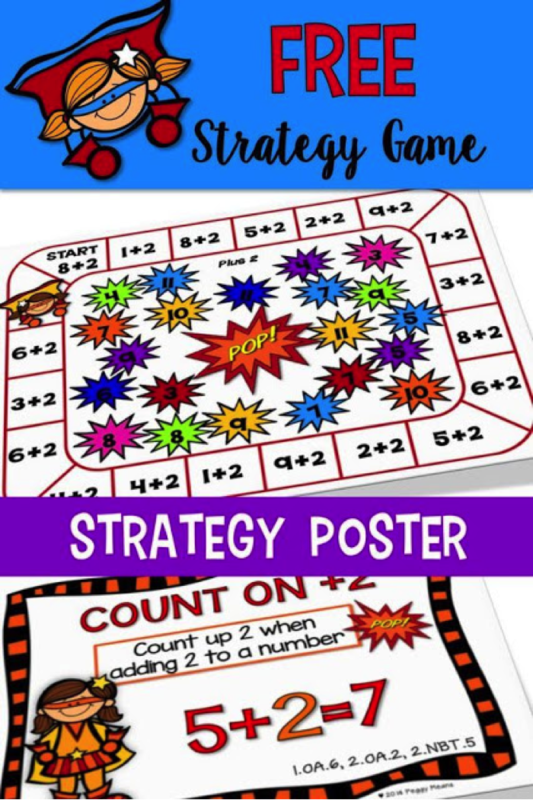 Try one of the games that will help you implement all 3 tips: 1) It uses the mental math strategy, “Count On +2”. 2)Provides great 10-15 minute practice. 3) super engaging! 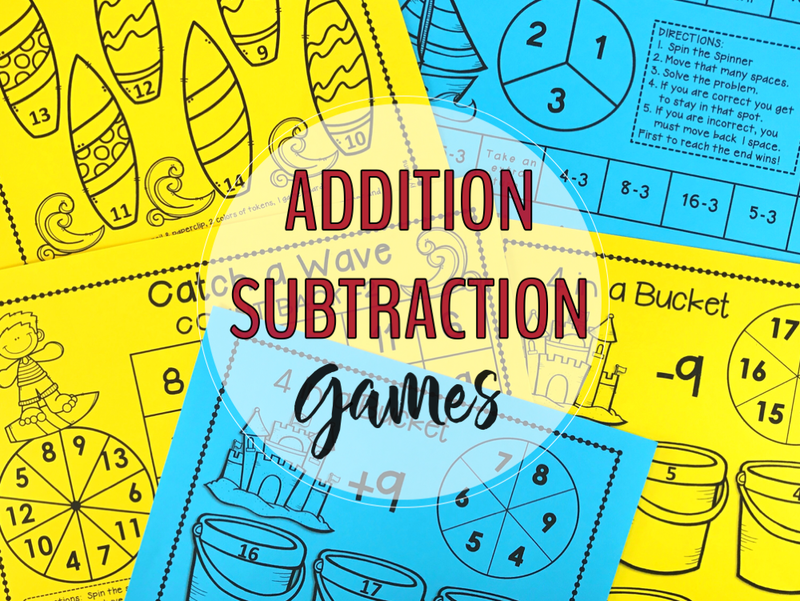 Your students will enjoy playing this engaging game with their friends and becoming more fluent in their addition math facts in the process! Success! Now check your email to confirm your subscription and get your free game! 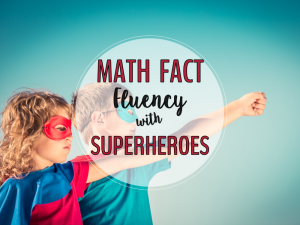 Improve Math Fact Fluency with Super Heroes! This was an amazing post! Thank you so much for sharing!! Thank you, Laura, that is very encouraging! Hello, I am trying to access the 11 games you listed to help develop math fact fluency, but when I click on the picture it takes me to writing tips instead. Can you ehlp me find the math games please? Thank you for sharing. Hi, Jill, I am so sorry the link is not taking you directly to the games! 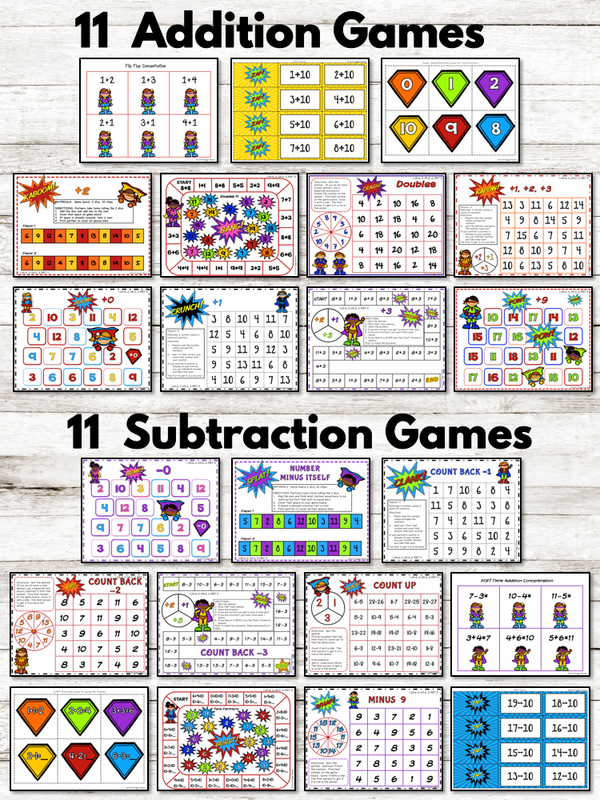 I now have subtraction games, posters, and partner activities available. Great post. Worthy information for sure and a good beneficial one for readers. Thank you, Aditya! I am delighted to hear that this was helpful! Any chance you will make a multiplication/division one? 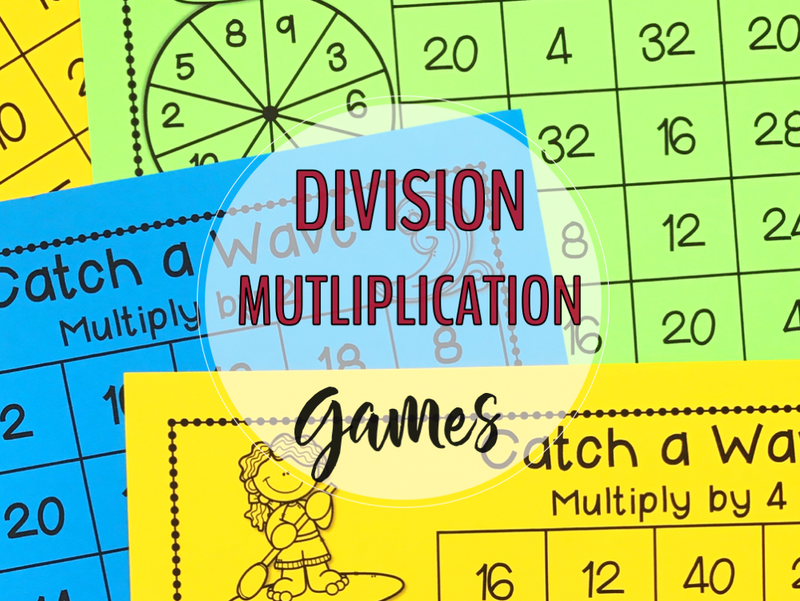 Hi JB, Thank you for asking – I worked an multiplication/division over the summer! I think you will like them! What a great post! And your activities are amazing. Just what my first graders need. 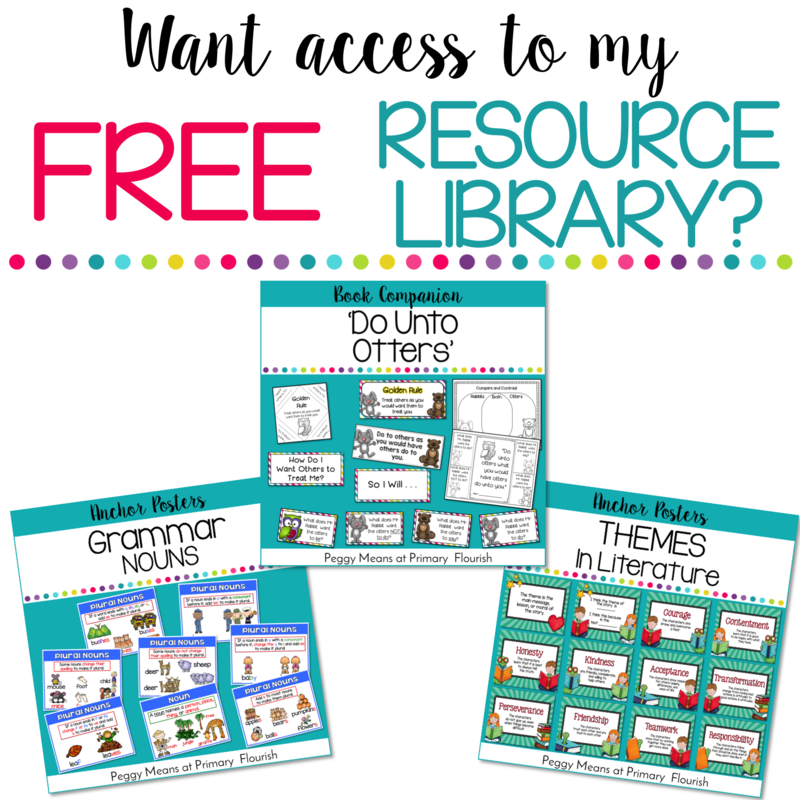 I am so delighted to hear that these activities are helpful to your firsties!